One of the most effective and alluring fitness products on the market today. The AB Rev is an abdominal tool that takes existing and proven abdominal exercises, like the crunch and reverse crunch and turns them into a super charged exercise that anyone can do. The exercise machine works the lower and upper abdominals together. It gives you a full oblique workout; these are the muscles responsible for a flat stomach. The exerciser takes other muscles (back, shoulders) out of the exercise and allows you to isolate and concentrate on the abs. The exerciser will give you tighter, stronger and more defined abs as well as the flat stomach you've always wanted.Doing abdominal crunches on the exerciser is a perfect abdominal workout. This Abdominal tool's Triple Action Technology lifts your pelvis and legs with an anatomically precise motion that targets your upper, middle, lower abs and obliques all in one fat burning motion. For the first time ever, everyone can do a perfect reverse crunch, using the exercise machine. This unique and patented product is the first product ever endorsed by Dr. Rabinoff, renowned investigator of fitness products. Scientific Studies show superior hip, spinal, and trunk extension when compared to other abdominal products. 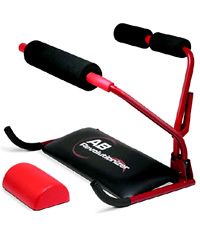 Sleek design and advanced technology make the Abrevolutionizer one of the most effective and alluring fitness products on the market today.